Running a hotel is tough work. From maintenance to guest requests to the updates and safety of the hotel, there is a lot that goes into its operation. When the guest’s safety is at risk, we at Spaulding Decon understand that you want what is best for your patrons, which is why for decontamination; there is no other company to call but us. Hotel rooms see hundreds of people a year and with each person comes a risk. Accidents are bound to happen in hotels due to the sheer number of people that interact with them. Hotels can also be the site of homicides, suicides, and other unattended deaths, all of which require professional decontamination. If an event happens in one of your hotel rooms that involves blood, a professional must be contacted before it can be used again. 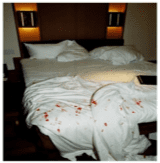 Blood cleanup in hotels is not a task that can be done by your maintenance team. Blood is a biohazard that can carry pathogens and spread disease, which is why any type of interaction with blood should only be done by the professionals. Blood can contain bacteria and pathogens such as HIV and Hepatitis B that can be spread through touch and inhalation, so it is important to avoid any kind of contact with the blood. Oftentimes, people assume any carpet cleaning company would be able to steam clean a room to remove blood stains. While this may be an option for other cleaning needs in a hotel, blood requires professional care. Carpet cleaners simply push water and steam into the carpet and then attempt to vacuum it. This pushes blood into the subflooring, creating an even more dangerous environment. On top of the lack of equipment, carpet cleaning companies will not have the proper training to ensure the safety of their employees, your hotel guests, and to ensure the room is restored completely. Professional crime scene cleanup technicians have special bloodborne pathogens training that enable them to clean up the mess properly and safely. They have the equipment needed to remedy the hotel room and they know how to stay safe while doing it. Carpets, drapes, mattresses, bedding and other porous materials can all be infected by blood. There may be items in the hotel room that cannot be saved; these items will need to be properly disposed of at a biohazard waste facility, which Spaulding Decon will do. Any items that can be saved will be decontaminated, cleaned, and restored to a usable condition in order to restore the room to its original state. Spaulding Decon understands that reputation is important in the hotel business; a death or tragedy in your hotel could cost it business; for this reason, Spaulding Decon is fast, efficient and discreet. Spaulding Decon can be on scene within hours and start decontaminating the affected area, we will arrive in unmarked vehicles and unmarked uniforms in order to ensure your privacy and keep your reputation in-tact. For the best in the business for blood decontamination, call Spaulding Decon at (866) 993-3266 or visit our website at spauldingdecon.com to request a quote.